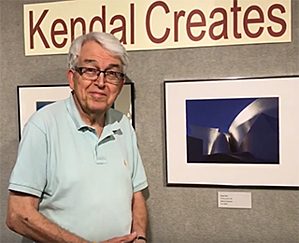 This year 40 residents have original artwork in the show, which is on display in Kendal’s three galleries through August 20. Meet three of the artists. A treasured piece of high-end fabric and refinished wood have brought new life to an old dining room chair under the artistic hands of Janet Kelsey Werner. “I loved the fabric and knew I would use it someday, and this is the someday,” Janet says. 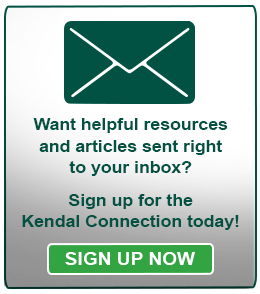 Janet purchased four chairs from Kendal’s Langston dining room during its renovation. Her first restoration is in “Kendal Creates.” She stripped the wood and applied four coats of stain, then added her favorite fabric to the chair’s back and a leather piece to the seat. Janet also loves doing needlepoint – not “little old lady” needlepoint but images, such as a replica of a ceiling tile from Cleveland’s Severance Hall. Food is one of Janet’s other passions. She was a newspaper food editor, a food and nutrition teacher, cookbook editor and owner of a shop that sold cookware and operated a cooking school. “Retirement meant returning to school to get a master’s degree in nutrition and gerontology. 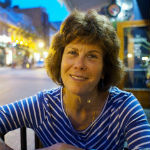 I graduated at age 60,” she explains. Photography has been Grover Zinn’s steady companion. In 1969, while teaching religion at Oberlin College, he got a summer grant to photograph churches and cathedrals in England and France. He was on a limited budget and film was expensive, so he only took one or two photographs of each site. “And 90 percent of the photographs were good. I got two of my best stained-glass photographs during that trip,” he says. A second summer grant sent him back to Europe, and he took photographs of pilgrimage sites in England, France, Spain, and Italy. Grover used the photographs in his classes, and now many of them are in a collection at the Center for Study of World Religion at Harvard University. He has also photographed many Catholic missions in New Mexico and other Southwest states. As a lecturer on Oberlin College alumni trips to Russia, Syria, and Egypt, Grover got the opportunity to add more travel photographs to his collection. In 2016 he went to Mongolia and came across a herd of camels, which is one of three photographs Grover submitted for this year’s show. Along with photographs of his travels, Grover likes to take pictures of architecture, especially of buildings in the Los Angeles area where his son lives. Two of his favorites are Frank Gehry’s Walt Disney Concert Hall and the Getty Center, which are in the show. “They are such remarkably designed buildings for photographing architectural shapes,” he says. Nina Love’s love of knitting began as a child living in Copenhagen, Denmark. It was just after World War II and food and clothing were being rationed. “Every child got a ball of yarn, part wool and part paper fiber, to make a pair of mittens,” she says. The mittens were scratchy, but Nina was smitten with the craft. She learned all the knitting techniques, and later as an adult came across a book entitled “Knitting without Tears” which encouraged a knitter to be inventive and creative. She applied that approach to knitting colorful baby wool blankets, a diamond-shaped one which is in “Kendal Creates”. “People are mystified by this thinking I’ve sewn it together, but it’s all knitted in one piece from the bottom to the top,” she says. She knits using two colors at the same time, and in such a way that there is no front or back to the blanket. She’s now at work on her seventh blanket. “I love blankets, one size fits all,” she says.